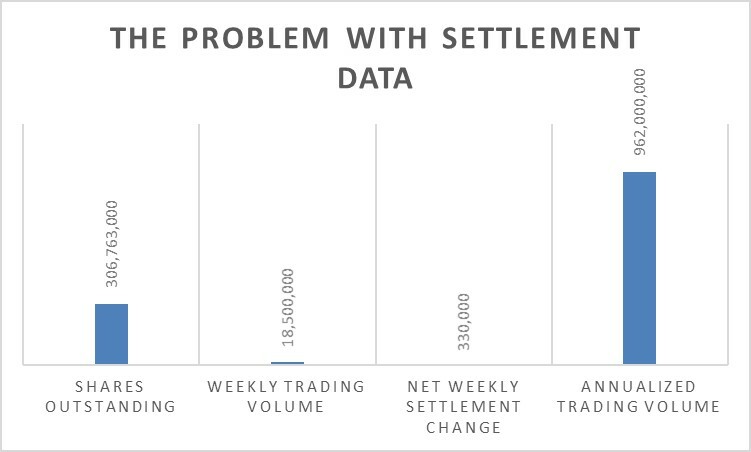 Why is a paltry dab of trading volume showing up in settlement data? Those of you with furrowed brows wondering what I’m talking about, let me explain. Speaking of explication, I’ll be sharing our discoveries about exchange-traded funds with the Connecticut/Westchester NIRI chapter this evening (and spending most of this week in New York). So, when there is a buyer of shares interacting with a seller of shares, and one takes possession from the other, a process ensues whereby ownership of shares is transferred (blockchain would make this a snap). That’s settlement data, today overseen by the Depository Trust and Clearing Corp (DTCC). You’d think it would happen with every trade. Not so. If you use settlement-focused market intelligence, you can see it yourself. We’ll come to that in a moment. In the 1980s before markets were electronic and interconnected, before high-frequency trading, exchange-traded funds, widespread share-borrowing, the explosion of passive investment, mushrooming use of derivatives, the implosion of stock-picking and the great vanishing of depository banks from hundreds to four, most trades settled. If accounts at this handful of depository banks declined by 500,000 shares, and these over here increased by 500,000, one could tie out to 13F reports (dating to 1975 and unchanged since, an inexcusable SEC failure) and say the seller was Fidelity, the buyer T Rowe Price, and track shifting ownership. This past summer I attended an event with the CFO of the DTCC and we talked about shareholder identification. She told me that one could not look at settlement data and observe changes today as in the past because the accounts are consolidated now. Paraphrasing, she said the DTCC pays the dividends and consolidates shares for many investors. If buyers and sellers are in the same account, how could you see a change? Tally the NET of buying and selling in your most recent period, be that a week, a month, etc. Compare that net number to your trading volume in the same timeframe. I’ll give you an example. In the image here is a one-week change for a real company, a Nasdaq 100 stock. In a one-week period, settlement data showed a net change in ownership of selling of 330,000 shares, against over 300 million shares outstanding. But the stock traded about 3.7 MILLION shares every day. Over that five-day settlement period, total trading volume was 18.5 million shares. Just 1.7% of trading volume settled. Put another way 98.3% of all activity dr iving equity value was something OTHER than measurable change in ownership. What’s more, annualized trading volume equals three times total shares outstanding. Does the board of directors know these facts? The executive team? If not, why not? We in investor relations are the chief intelligence officers of the capital markets for our companies. If we leave the impression that owners are setting price when the data show something else, we are doing disservice to those with a fiduciary responsibility for oversight of what drives equity value. They sign on dotted lines, under pain of penalty. What’s the cause? Since decimalization and how Regulation National Market System forced a market-making model on the entire market, intermediaries that own nothing but trade everything have become a large part of volume. Nearly half of all trading volume is rented, not owned. It’s short. Borrowed. Used for a temporal purpose and returned to a margin account. Next, derivatives account for approaching 20% of trading volume in markets – substitutes for ownership where volume comes from a counterparty, not an owner. ETFs are a big culprit as collateralized stock substitutes, not ownership. We measure these effects every day for all clients. Disclosure rules have not kept pace with market behavior. Neither has settlement data. We have a solution that bridges the divide demographically. We measure 100% of trading volume via broker-executions (not exchange data), reflecting the rules. Those executions are comprised of mathematically distinct behaviors so you, the board, the executives, are never left with the unsettling sense of missing 98% of the answers. The market has changed. We must adapt. And guess what? It’s far better all around! It’s easy, reliable, contemporary and effective. And test me on this: Your board and executives will appreciate your leadership.